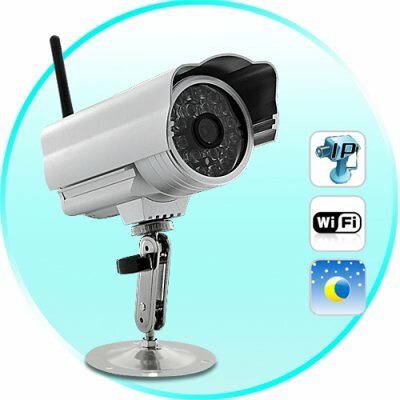 Successfully Added IP Security Camera (WIFI, IR Cut-Off Filter, Night Vision) to your Shopping Cart. Easy to setup and use, feature-rich, waterproof IP security camera with WIFI, night vision, and Cut-Off filter functionality! When you can't be there yourself, you can with this IP security camera! Surveillance Anywhere: From your office in Paris, look in on your home in Lisbon. From your hotel in Moscow, monitor your business in Barcelona. That's what makes this IP Security Camera such a top choice when the safety and security of those you love is a top priority. Extremely easy to setup and use: It's so simple to setup even a seven year old could do it. Don't believe us? One, plug the camera into a power outlet. Two, connect your Ethernet cable to this security camera if you want a wired connection. If you're going wireless, attach the WIFI antenna. Three, install the software which will generate an IP address for you. Four, put that IP address into any Internet Explorer browser and PRESTO! You're viewing what the camera sees! Even if you're half way across the world. Clearer Images: Infrared (IR) cut-off filters are used with color CMOS imagers to produce accurate color images. An IR cut-off filter blocks the transmission of the infrared while passing the visible. This technology makes the images captured more vivid and clearer. With tons of advanced features, this IP camera is brought to you by Chinavasion at an astonishing low wholesale factory direct price. Click "Add to Cart" right now and we'll express ship you a sample to enjoy it for yourself. Then when you see how outstanding the quality is, feature it on your online store for some easy and high profit sales for your website. Available from your source for high tech gadgets, Chinavasion.